For other people named James Irwin, see James Irwin (disambiguation). James Benson "Jim" Irwin (March 17, 1930 – August 8, 1991) (Col, USAF) was an American astronaut, aeronautical engineer, test pilot, and a United States Air Force pilot. He served as Apollo Lunar Module pilot for Apollo 15, the fourth human lunar landing. He was the eighth person to walk on the Moon and the first, and youngest, of those astronauts to die. Irwin was born March 17, 1930, in Pittsburgh, Pennsylvania, of Scottish and Irish descent, to parents James Irwin and Elsa Mathilda Irwin (née Strebel). Irwin's grandparents emigrated to the U.S. from Altmore Parish at Pomeroy in County Tyrone, Ireland (now Northern Ireland) around 1859. At about the age of 12, he informed his mother about his desire to go to the Moon, letting her know that he might be the first person to do so (he ended up being the eighth). He graduated from East High School in Salt Lake City, Utah in 1947. He received a Bachelor of Science degree in Naval Science from the United States Naval Academy in 1951, and Master of Science degrees in Aeronautical Engineering and Instrumentation Engineering from the University of Michigan in 1957. He received initial flight training at Hondo Air Base and follow-on training at Reese Air Force Base, Texas. He graduated from the Air Force Experimental Test Pilot School (Class 60C) in 1961, and the Aerospace Research Pilot School in 1963 (Class IV). Prior to joining NASA, he was chief of the Advanced Requirements Branch at Headquarters Air Defense Command. During his time in the United States Air Force he received the Air Force Distinguished Service Medal and two Air Force Commendation Medals. He also received an Air Force Outstanding Unit Citation while with the 4750th Training Wing. Irwin was also a developmental test pilot for the Lockheed YF-12, the Mach 3 fighter-interceptor variant which preceded the SR-71 Blackbird. His first flight of that aircraft was on the day that one of his five children was born. In 1961, a student pilot that Irwin was training crashed the plane they were flying on a training mission. They both survived, but Irwin suffered compound fractures, amnesia, and nearly lost a leg. John Forrest, a U.S. Air Force orthopedic surgeon, was instrumental in preventing the amputation of Irwin's leg. During his military service, he accumulated more than 7,015 hours flying time, of which 5,300 hours were in jet aircraft. Irwin was raised in a Christian household but stopped actively practicing the religion at age 10. He became a devout born-again Christian after returning from space. In 1952, Irwin married his first wife, who was a Catholic. The two had an unhappy marriage made worse by his devotion to his work. By his own account, the marriage failed after two years due to his poor, borderline cruel treatment of her, and he later stated that finding religion again made familial relationships much easier. In 1959, Irwin married his second wife, the former Mary Ellen Monroe. They were married until his death. Irwin was one of the 19 astronauts selected by NASA in April 1966. He was chosen as Commander, with John S. Bull as Lunar Module Pilot, for LTA-8, an environmental qualification test of the Apollo Lunar Module in a vacuum chamber at the Houston Space Environment Simulation Laboratory. He then served as a member of the astronaut support crew for Apollo 10, the first mission to carry the full Apollo stack to the Moon and the dry run for the first manned Moon landing. Following that assignment, Irwin served as backup Lunar Module Pilot for the second Moon landing mission, Apollo 12. Between July 26 and August 7, 1971 – as the Apollo 15 Lunar Module Pilot (LMP) – Irwin logged 295 hours and 11 minutes in space. His extravehicular activity (EVA) on the Moon's surface amounted to 18 hours and 35 minutes of the mission time (an additional 33 minutes was used to do a stand-up EVA by opening the LM's docking hatch to survey the surroundings and take photographs). Irwin and David Scott's mission was more science-based than previous missions, which meant that they received intensive geological training to meet the demanding nature of the J-Mission profile. This extra training is credited with allowing them to make one of the most important discoveries of the Apollo era, the Genesis Rock. Apollo 15 landed in the Moon's Hadley-Apennine region, noted for its mountains and rilles. As a J-Mission, they would spend more time on the Moon than previous missions, to allow for three EVAs. As well, Irwin was the first automobile passenger on the Moon as Scott drove the Lunar Roving Vehicle (LRV) carried along for this mission in the Lunar Module (LM) Falcon's Descent Stage. Scott and Irwin's stay on the Moon was just under three days at 66 hours and 54 minutes. Once the rendezvous procedure was completed between Falcon and the Endeavour CSM, Irwin and Scott were busy moving items like rock samples into the CSM and preparing the Lunar Module for final separation. During this intense period of work the earliest symptoms of a heart condition appeared. Both Scott and Irwin had been working with no sleep for 23 hours, during which they conducted a final moonwalk, performed the ascent from the lunar surface, rendezvoused with Endeavour, and encountered the problems that delayed the Lunar Module jettison maneuver. The astronauts' physiological vital signs were being monitored back on Earth, and the flight surgeons noticed some irregularities in Irwin's heart rhythms. Irwin's heart had developed bigeminy. Dr. Charles Berry stated to Chris Kraft, deputy director of the Manned Spacecraft Center (MSC) at the time: "It's serious, [i]f he were on Earth. I'd have him in ICU being treated for a heart attack." However, Berry concluded that since Endeavour's cabin atmosphere was 100% oxygen when in space, Irwin was in the best of circumstances. Specifically, "In truth, ... he's in an ICU. He's getting one hundred percent oxygen, he's being continuously monitored, and best of all, he's in zero g. Whatever strain his heart is under, well, we can't do better than zero g."
During the post-trans-Earth injection (TEI) phase of the mission there wasn't much more for Irwin to do other than provide help with Al Worden's EVA to retrieve film magazines from the CSM's SIM bay, by donning a pressure suit and monitoring him. He was able to rest and apparently recover during the rest of the mission. The flight surgeons continued to monitor his EKG until splashdown, but his heart rhythm was normal. This incident was not discussed during the mission debriefing sessions, and the condition did not appear when he returned to Earth. After the return of Apollo 15 to Earth, it was discovered that, without authority, the crew had taken 398 commemorative first day covers to the Moon of which a hundred were then sold to a German stamp dealer. The profits of the sale were intended to be used to establish trust funds for the Apollo 15 crew's children. NASA had turned a blind eye to similar activities on earlier flights, but on this occasion the administration reprimanded the astronauts, and they never got any funds from the sales. Irwin had announced his intent to retire from the Air Force and resign from NASA prior to the reprimand. —Irwin, describing his experience during the Apollo 15 lunar mission. By his own admission, Irwin was not a committed Christian during his years at NASA. After his retirement as a Colonel in 1972, Irwin founded the High Flight Foundation. He spent the next 20 years as a "Goodwill Ambassador for the Prince of Peace", stating that "Jesus walking on the earth is more important than man walking on the moon". He said that his experiences in space had made God more real to him than before. Irwin and his wife stated that his Christian rebirth, which happened while he was in space, saved their marriage and made their lives much happier. Beginning in 1973, Irwin led several expeditions to Mount Ararat, Turkey, in search of the remains of Noah's Ark. In 1982, he was injured during the descent and had to be transported down the mountain on horseback. In More Than Earthlings, Irwin wrote expressing his view that the Genesis creation narrative was real, literal history. Irwin suffered three major heart attacks. One occurred less than two years after Apollo 15, when Irwin was 43, while he was playing handball. Irwin suffered another heart attack in 1986, when he collapsed during a run and was found pulseless on a curb. Doctors from NASA doubted the incidents were related to space travel, and noted that pre-flight testing indicated a tendency for cardiac arrhythmias during strenuous exercise. On August 8, 1991, Irwin suffered another heart attack after a bike ride. Attempts at resuscitation were unsuccessful, and Irwin died later that day. He was buried at Arlington National Cemetery. He was survived by his widow, Mary Ellen, to whom he was married for three decades, and their five children. Of the 12 men who have walked on the Moon, Irwin was the first to die. The James Irwin Charter Schools were founded in Colorado in his honor. A patch cut by Irwin from a backpack abandoned on the Moon during the Apollo 15 mission was auctioned at Christie's in 2001 for US$310,500 in a consignment of material from Irwin's estate that garnered "a combined $500,000". Irwin was a member of the Air Force Association and the Society of Experimental Test Pilots. He was also a Freemason, initiated in Tejon Lodge No. 104 in Colorado Springs. Irwin was a member of Civitan International a nonprofit organization promoting community service, scientific research, and service to people with intellectual and developmental disabilities. Irwin's other awards include: Belgium's Order of Leopold in 1971; Kitty Hawk Memorial Award, 1971; New York Police Department St. George Association's Golden Rule Award in 1972; Christian Service Award; Milan Hulbert Trophy of SWAP International in 1973. He was also awarded an Honorary Doctorate of Astronautical Engineering from the University of Michigan in 1971; an Honorary Doctorate of Science from the William Jewell College in 1971; and an Honorary D.Sc. from the Samford University in 1972. He was inducted into the International Space Hall of Fame in 1983, and posthumously into the U.S. Astronaut Hall of Fame, on October 4, 1997. In 1973, When Irwin visited the city of Minden, Louisiana, to address a gathering at the First Baptise Church, Mayor Tom Colten declared "James Irwin Day" and made Irwin an "honorary citizen of Minden." In the 1998 HBO miniseries From the Earth to the Moon Irwin was played by Gareth Williams. ^ a b c d e Reynolds, David West (2002). Apollo: The Epic Journey to the Moon. Tehabi Books. pp. 166–189. ISBN 0-15-100964-3. ^ "A Who's Who on Apollo Crew". Daily News. New York, New York. July 26, 1971. p. 12 – via Newspapers.com. ^ Allen, Sam (1985) . To Ulster's Credit. Killinchy, UK. p. 123. ^ a b c d e f g h i j k l m n o p "Biographical Data: James Irwin". Lyndon B. Johnson Space Center, National Aeronautics and Space Administration. August 1991. Retrieved 2007-02-15. ^ "Living With an American Hero | Latest Space News". Echoesofapollo.com. Archived from the original on 2011-08-10. Retrieved 2015-04-23. ^ "From Ike to athletes to Elmirans, surgeon touched many". Star Gazette. September 18, 2015. Retrieved December 10, 2017. ^ "The Moon-Walker's New Clothes" (PDF). NASA. January 19, 1968. Retrieved December 10, 2017. ^ a b c "International Space Hall of Fame :: New Mexico Museum of Space History :: Inductee Profile". Nmspacemuseum.org. Retrieved 2015-04-23. ^ a b Woods, David (2006-09-14). "Mountains of the Moon". Apollo 15 Lunar Surface Journal. NASA. Retrieved 2007-02-15. ^ a b Chaikin, Andrew (1998) . A Man on the Moon. Toronto: Penguin Books. ISBN 0-14-027201-1. ^ a b Woods, David (2004-05-28). "Apollo 15 Flight Summary". Apollo Flight Journal. National Aeronautic and Space Administration. Archived from the original on 2007-03-24. Retrieved 2007-02-15. ^ a b c d e Kraft, Chris; Schefter, James L. (March 2001). Flight: My life in Mission Control. New York: Penguin Group. pp. 342–34. ISBN 0-525-94571-7. ^ "Apollo 15 Technical Crew Debriefing" (PDF). NASA. August 14, 1971. Retrieved December 10, 2017. ^ Worden, Al (July 2011). Falling to Earth: An Apollo 15 Astronaut's Journey to the Moon. Smithsonian Institution Press. ISBN 978-1588343093. ^ a b c d Wilford, John Noble (10 August 1991). "James B. Irwin, 61, Ex-Astronaut; Founded Religious Organization". The New York Times. Retrieved 17 September 2016. ^ "Colonel James B. Irwin - About Us & Board". Highflightfoundation.org. Retrieved 2015-04-23. ^ "The Moon Is Not Enough". www.goodreads.com. Retrieved 2018-11-06. ^ Howe, Marvine. "Rush To Climb Ararat Gives Town A Lift". The New York Times. Retrieved 17 September 2016. ^ Bergman, Jerry (2013). 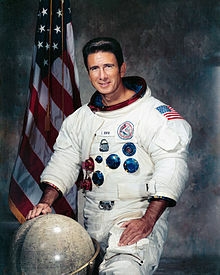 "Colonel James Irwin: Creationist Astronaut". Institute for Creation Research (from Acts & Facts. 42 (11)). Retrieved August 2, 2016. ^ Irwin, James B. (July 1983). More Than Earthlings: An Astronaut's Thoughts for Christ-Centered Living. Baptist Sunday School Board. ISBN 978-0805452556. ^ "Ex-Astronaut Apparently Has Heart Attack While Jogging". The New York Times. 8 June 1986. Retrieved 17 September 2016. ^ "James Irwin Charter Schools". James Irwin Charter Schools. Retrieved December 5, 2017. ^ "Irwin backpack patch sale". Antiques Roadshow Insider. 7 (2): 11. February 2007. ^ "Masonic Astronauts". Freemason Information. Retrieved 20 August 2018. ^ "Freemasons in Space". Grand Lodge of British Columbia and Yukon. Retrieved 20 August 2018. ^ "James B. Irwin | Astronaut Scholarship Foundation". Astronautscholarship.org. Retrieved 2015-04-23. ^ Pop McDonald, "Mayor Makes Col. James Irwin an 'Honorary Citizen of Minden,'" Minden Press-Herald, February 26, 1973, p. 1. ^ "From the Earth to the Moon, Full Cast and Crew". IMDb. Retrieved December 4, 2017. Wikimedia Commons has media related to James Irwin.